Amanda Murphy Design: Quiltermaker's 100 Blocks Volume 3 Blog Tour! Well, the blog tour for Quiltmaker's 100 Blocks is well underway and this is my day to talk about my block (and to giveaway a little something extra - see details below)! 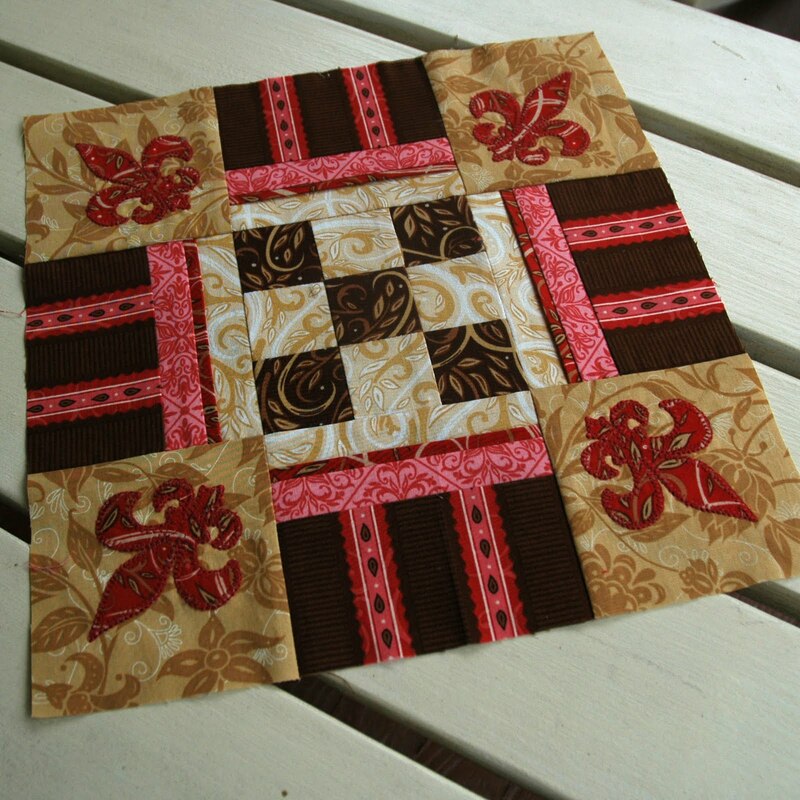 I used Swiss Chocolate sample yardage, which I had just received at the time the block was designed. You'll find the pattern on page 46 of Quiltmaker's 100 Blocks Volume 3, which should be out on newstands next week. 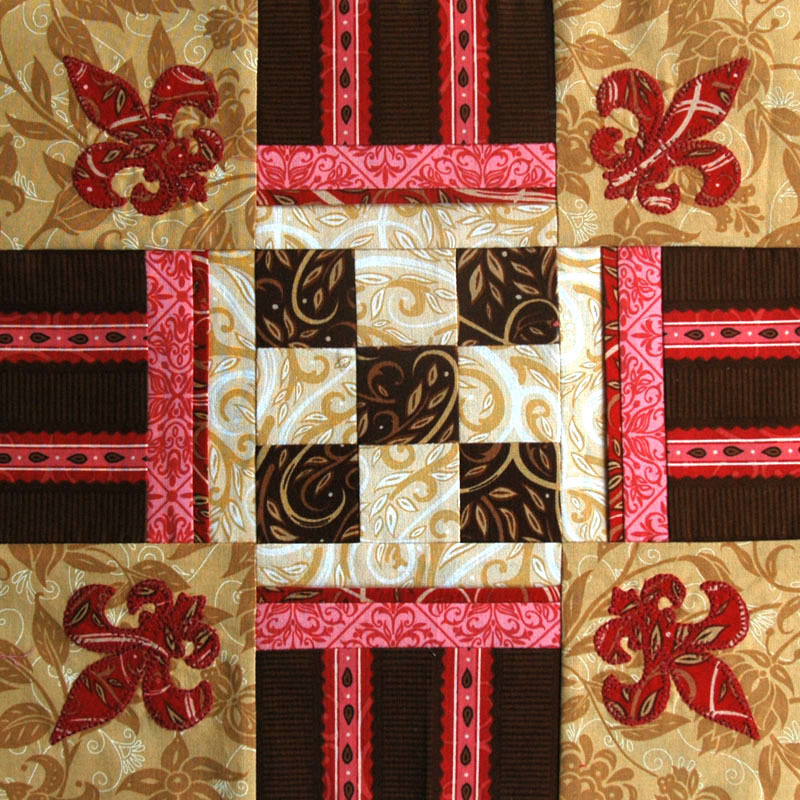 I've heard from many people who used Swiss Chocolate in home decor projects, so I thought it would be great to show you a table runner using this block x 3, with variations. And remember that Quiltmaker will be giving away a yard of each print of THE ENTIRE LINE OF SWISS CHOCOLATE courtesy of Robert Kaufman, along with other great prizes, later in the week, so check out their site. There are some great giveaways, along with links to other designers' fabulous sites! Hi, I am now a follower...and I love chocolate! Your block looks good enough to eat. Congrats on having it included in the magazine. I like your block choice and I really enjoyed seeing the table runner options. My favorite technique in quilting is actually the fabric selection. Thinking of new ways to put colors together and stretching my boundaries of what is 'acceptable' - even stretching the limits of my likes and dislikes. I love piecing - putting bits of fabric back together into lovely patterns - the best fun ever!!!! I already follow and I just love the browns and blues together - I'm a mocha fan! Congratulations on having your block published and thanks for the giveaway chance. I love applique! Adore your block and the French look of it - my favorite would be the Choc striped runner. Love your fabric line...the block you designed works so well with it! I can hardly wait for the magazine! Love the chocolate stripe..but when it comes to chocolate, there's no "bad" stuff out there! I'm still learning and too new to have a favorite...I find it all enthralling! I signed up to follow. Looks like your kids will be getting ice cream soon! I love everything about quilting but my very favorite thing is probably paper piecing. And your runners and fabrics are gorgeous - I think Chocolate Blossom is my very favorite. I just became a follower - but have been a fan through magazines for a little while! I hope the kids get their ice scream!! I use my machine and plug away slowly at my quilting. I use the Quilt Pounce and find it easier that way...I hope to work up the nerve for FMQ! Great runner! Love the Mocha striped one. As a new quilter, I don't have a favorite technique--I'm still trying to master the basics! Thanks for the chance to win! LOVE the Chocolate Blossum runner and truly loved this line of fabric. - I will folow you. Favorite quilting technique - I have my quilt professionally quilted so I can spend my time piecing and creating. Chocolate Striped is my favorite runner because of the pink stripe...it looks very striking. My favorite quilting technique is needleturn applique, but I'm starting to be a big fan of Cindy Blackberg's stamped templates for hand piecing...they make it much more accurate and portable. I'm all for helping your children get to go out for Ice Cream. I like all types of quilting techniques except paper piecing- I like the precision, but the paper...aaagggg. If looking at other people's quilts was a technique I'd say that was my all-time favorite! The thrill of discovering fabrics and colours that make sense together, the design process might otherwise rate the most enjoyment for me. Then, the actual quilting and binding because the vision has nearly been realised, many times very different to what I'd expected. The in-between stuff is mainly hard work and frustration as I try to get points to match etc... Thanks for asking...your work is superb, I especially like the bold beauty of Chocolate Stripe, it's not hard to imagine that in our home? God bless you. 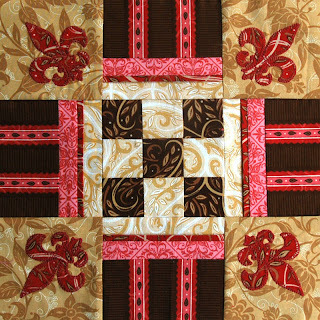 I am following your blog...I just love the Chocolate Blossom Tablerunner. The red just jumps out at you. As far as my favorite quilting technique...hum...since I am new to quiliting, I do love picking out the fabric and enjoying making some yo-yo's and EPP. Thank you for the giveaway! The chocolate stripe is terrific--but then, I'm addicted to chocolate. Love the block in any color. Congratulations. Hi again. I'm now a follower--because I enjoyed reading your blog!! And, I wanted to help ensure our kids get ice cream! I still find my favorite technique is simple piecing. I do some applique, but find that I relax a whole lot more when I am sitting at my sewing machine and just feeding one piece after another. I like all the tablerunners, but would choose the mocha stripe. --- makes me yearn for some chocolate. Looks like the kids get ice cream!! I am now a follower. I LOVE your fabrics -- the Chocolate striped one is my favorite!! My favorite quilting method is applique, and I do like to hand quilt. WE ALL SCREAM FOR ICE CREAM...get your shoes on, there are over 250 followers now! My favorite quilting technique would be stippling because I don't have to think, just go! I have so many projects right now, the quickest way is the best for me. Love, love your chocolate striped runner, so that would be my choice if I were to win...thanks for the giveaway. Your fabrics are great! I enjoy traditional and paper piecing, not much of an appliquer. If I am the lucky winner, I would choose the Mocha Blossom...I love the touch of blue! I am a brand new follower. Favorite technique? LOL, do I have to be able to do it? I pretty much stitch in the ditch and well, my stippling is getting better :) Thanks! I love your block, its a great one for fussy cutting your gorgeous fabric. I'm already a follower. I like the first table runner the best. Its hard to pick my favorite technique--maybe machine blanket stitch applique. I'm too new of a quilter to have a favorite technique. Love the runner in Mocha. Good luck getting to that ice cream -- I'm following now, hope that helps, kids! Beautiful. I love the chocolate blossom...well, I love all of the runners! As far as technique, I love to try them all but so far regular piecing is my favorite. Chocolate blossom gets my vote! Great runner. I'm a follower - so enjoy going for ice cream. Thanks for the give away. I love piecing and hand applique. I love this block - especially the fleur de lis. I have just learned to love applique to go along with the piecing. I am a follower of your lovely blog already :) As I am just starting to quilt, I don't yet have a favorite technique! The Chocolate stripe runner is absolutely stunning!! Would love to win it. I'm following you! I LOVE LOVE LOVE your blocks - and I especially like the Mocha Striped Runner. Favorite technique? Finishing! LOL! i'm a new follower! i think my favourite technique is strip piecing - because i'm impatient!! i also really love straight line quilting, especially if the backing is flannelette, it creates the loveliest texture! Love Chocolate Blossom Runner --the fussy cutting is great. I don't know if this posted already, sorry if it is a duplicate. Love the chocolate blossom runner! My favorite quilt technique--free-hand feather quilting. I love all the runners...but think the Chocolate Blossom is my favorite. What yummy colors! I just became a follower...not really sure how that works, but will learn as I go. I don't have a favorite techinque, I'm always looking to try something new...but I do love piecing. I am already a follower and would love to see the mocha blossom runner on my table! Great block - thanks for the chance!